Through the years, we've seen residents move away from our independent living community to assisted living or nursing homes long before they truly needed to. Those communities are the ideal location for those who require continuous, around the clock care and supervision. Those communities determine what you need, your daily activities, when you eat and when you travel and charge you a hefty monthly fee for these services. The national median rate for a one bedroom assisted living unit is $3,661 per month! When we realized how many of our residents were moving to assisted living but were only requiring a fraction of the services they were being charged for, we decided then and there to find an alternative to keep our residents in their homes and avoid a premature move. The solution was to become designated by the state of North Carolina as a Multi-Unit Assisted Housing with Services community. This essentially means that we are an independent living community where residents do not require supervision or continuous care but may require some personal care or nursing from an outside agency. The Resident Care Program is the assistance you need, when you need it. These services for seniors, both healthcare and non-healthcare, allow you to age in place or recuperate effortlessly after a hospital stay or surgery within the comfort of your own home. Housekeeping Services are available. Weekly, bi-weekly, monthly or quarterly cleanings are what most residents schedule but our housekeeping team is available to assist with any task. Our Resident Services Front Desk staff is on-site and available 24 hours a day, 7 days a week. Our front desk is never closed so you will always see a friendly, helpful face. Recycling Centers are located on the first, second, and third floors of The Dorchester building. Maintenance is available 24/7 for emergencies. Need a light bulb changed? No problem! Maintenance is on-site and available to respond to work order requests. Residents simply contact the front desk to submit a work order or they may do so online. Residents may elect to have an Emergency Response System installed in their apartments to alert management and medical personnel if assistance is required. scheduled with Bayada. Weekly errand and entertainment trips are scheduled for our residents aboard our motor coach. ATR is a premiere physical therapy services provider in the Charlotte region working within the Manor Community to address needs for the residents. They also can address the pain and prevention needs of the community through the Aging Stronger Program or Fall Prevention Program. 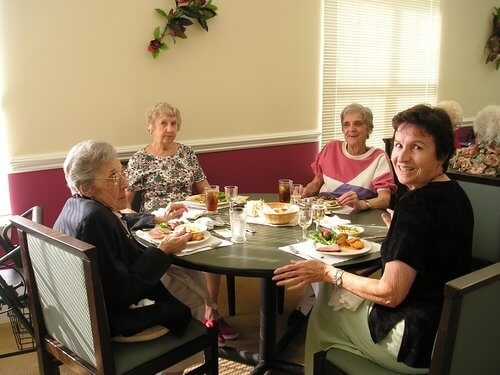 ATR’s Aging Stronger Program is designed to make the residents more independent so they are able to take advantage of the lifestyle offered here. The Magnolia Dining Room is on the first floor of The Dorchester and is open seven days a week for lunch and market. Dinner is served Monday-Friday and a monthly menu is available for residents. Residents only pay for the meals they attend as every apartment is equipped with a full kitchen. Delivery is also available at no additional charge.